1 Verismo 600 system ― what is it? Verismo 600 system ― what is it? First of all let us mention, that Verismo brewers are specific single-serve coffee machines that were developed to make just Starbucks special beverages. So if you are not a Starbucks lover, then it would be better if you look for something different for example Nespresso pixie. But if you’re a Starbucks fan then be ready to know every feature of this perfect single-serve animal. 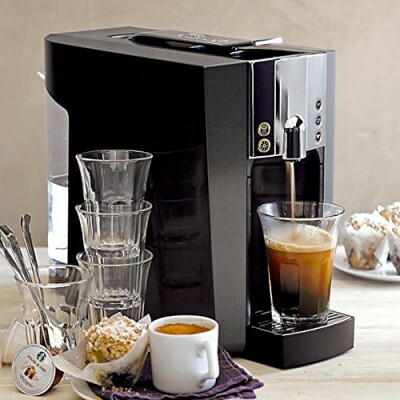 Verismo has very specific exterior with outstanding border lines and soft angles. The body is made of plastic and drip tray and control panel are made of stainless steel. Such a combination allows the machine to fit any household or kitchen. The plastic that was used in developing the machine body has rather high quality. It is very strong but very soft looking. It is commonly known that to brew a perfect cup of espresso you need the pump pressure equal to 15 bars. This coffee machine produces pressure equal to 19 bars. It is more than enough for the perfect cup of coffee with specific dense foam and nice taste. You know, to brew real Starbucks beverage you’ll need to «play» with temperature. Water for your coffee will need to be one temperature, milk ― of another. Different coffee types need to have different water temperature. Verismo 600 allows you to get it by one touch. You have to insert the capsule and push the button. The system will check water and milk temperature and brew your perfect cup of beverage in the famous Starbucks style. hot water button (to get the hot water when needed). Every beverage is volume programmable, so you may brew exact volume of the drink you want. The machine will remember your favorite cup size even when the power is off. Verismo 600 is very convenient coffee brewing system. While working with pods it has a great stand-by function. Machine will shut-off after 15 minutes that will get the energy consumption. Another feature is a drip tray of stainless steel that will accommodate to any cup size. While searching for the perfect coffee machine, make notice on the water tank. If it’s removable ― it’s good coffee machine. Removable water tanks are more convenient; they are easy to use and cleaning. You have no risk to pour water into the mechanism while filling the removable tank. The water tank in Verismo 600 is removable of 1 l volume. For those who are quite lazy, Verismo has a storage for used pods. You can store 10 pods in a special container and utilize them after the container is full. More than this, Starbucks gives one-year warranty on each coffee machine of its development. Verismo 600 is a coffee brewing system for Starbucks lovers. It works only with special single-serve capsules, like any other pod system. Capsules are not compatible, so you won’t be able to use other pods except the Verismo pods. So, make sure you want it. If you want to have a small Starbucks in your kitchen then this coffee machine is for you. Otherwise, watch over other variants.